This is the Whitsundays page. Be left breathless as your panoramic flight takes you over all the high spots in and around the beautiful Whitsunday Islands. Enjoy a comprehensive commentary as you fly over the majesty of Daydream Island, South Molle Island, Hayman Island, Hook Island, Whitsunday Island and Whitehaven Beach! 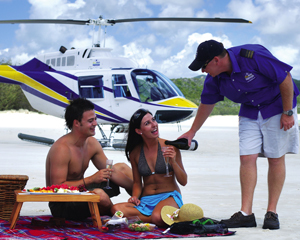 Travel by high-speed catamaran in style to the pristine sand of Whitehaven Beach and the cosmopolitan Hamilton Island. At Whitehaven Beach, enjoy a swim in the crystal clear waters. At Hamilton Island, utilise the extensive resort facilities including pools, shops and restaurants. Performance sailing in comfort. Wide, flat decks above and spacious accommodation below with only twelve guests in a friendly intimate environment. Enjoy the cutting edge speed of this fun sailing adventure aboard a thoroughbred racer. Get involved in the sailing or sit back and take in the view. Whitsunday Island holiday package including coach and vessel transfers, backpacker accommodation at Airlie Beach and Long Island and three of the must do day trips in the Whitsundays - the Great Barrier Reef Adventure, Camira Sailing adventure visiting Whitehaven Beach and Ocean Rafting. One of the best days out in the Whitsundays. Cruise onboard 'Camira' one of the worlds fastest sailing catamarans and visit famous Whitehaven Beach. this is an all inclusive day so all you need to do is site back and enjoy this awesome day! Feel the wind in your hair and the spray on your face as you and three others soar high on a trapeze, suspended out on the side of a catamaran! This high-speed catamaran adventure will see you whizzing over the waters of Hamilton Island in the Whitsundays. This sailing adventure is like no other! Whitsundays Sailing Adventures offers classic sailing vessels and Tall ships for a sensational value for money from 2 day/ night and 3 day/2 night cruises in the Whitsundays. Taking in the very best the Whitsundays have to offer. Experience the Whitsundays splendour with an overnight stay upon the Great Barrier Reef. The stars twinkle, moonlit crystal waters gently lap against spectacular coral walls. Everything is included when you Stay, Dine & Dive from our floating pontoon out on the Great Barrier Reef! This 20 minute scenic helicopter flight will give you ideal photo and video opportunities over The Whitsundays whilst offering the spectacular views of the coral fringed Whitsunday Islands, the lush rain forests and the world famous white sands and sparkling seas of Whitehaven Beach. Learn the ropes of sailing on the famous Sydney Harbour. Our qualified instructor will take you through the fundamentals of sailing including safety, wind and boat direction, rope work and steering under sail. If you would like to explore the Whitsunday Islands but want to create your own itinerary then this pass is for you. Armed with your unlimited island hopping ferry pass, a timetable and a map you can head out for the day to discover the islands. Sail, Dive, Snorkel, Explore, Beachwalk, Bushwalk or Relax. Islandive delivers an exciting and adventurous sailing and diving experience for the fun seeking adrenalin enthusiasts. Providing overnight live aboard scuba diving voyages that explores the Great Barrier Reef. Beyond the islands and their fringing coral reef lies the outer Great Barrier Reef and together they provide some of the most incredible snorkelling and diving you will ever experience. This sailing adventure combines the thrill of sailing out on a trapeze with a stunning scenic trip around Hamilton Island. Feel the excitement as you and three others soar high on a trapeze, suspended on the side of a catamaran! Experience the beauty of the Whitsundays as you glide above the waves! This 6-day Sea Kayaking Tour of the Whitsundays Islands is an incredible, once-in-a-lifetime adventure taking in some of the most beautiful scenery in the world. 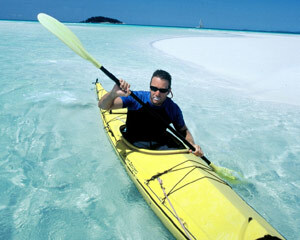 This 1-day Whitsundays kayak journey has been called the best sea kayaking trip in Australia. Explore and snorkel Molle Island, home to sea turtles, dolphins & a myriad of other marine life. Escape by Sea Kayak to snorkel and visit giant sea turtle and dolphins in the Whitsundays. Explore the stunning Whitsundays with us on our luxury cruiser. During the day you will get to enjoy three magical destinations - Whitehaven Beach, Hill Inlet Lookout and a local reef for snorkelling and diving. During July to September you may even be lucky to spot a whale during their migration. Whitehaven is one of the worlds most famous beaches. 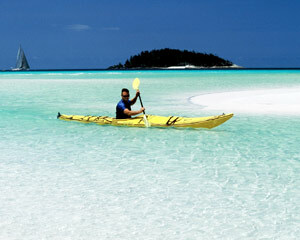 Sail from Shute Harbour to this spectacular 5km pure white silica sand beach. Enjoy a picnic lunch served under the shade of the trees while you bake on the beach. Then why not go for a swim in the crystal clear waters of the Whitsundays. This 20 minute scenic helicopter flight will give you ideal photo and video opportunities over the stunning Whitsundays. You'll experience breathtaking views of the coral fringed Whitsunday islands, the lush rain forests and the world famous white sands and sparkling seas of Whitehaven Beach. Have beautiful island adventures on the Whitsunday 2-Island Day Trip! You'll have great fun exploring your surrounds, swimming in resort pools and lazing on the beach. Including Daydream and Long Islands, plus lunch, this experience takes you on a discovery tour of Australia's favourite islands. 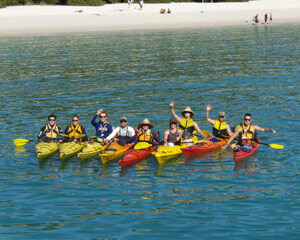 Have beautiful island adventures on the Whitsunday 2-Island Day Trip! You'll have great fun exploring tracks, swimming in resort pools and lazing on the beach. Including Daydream and Long Islands, plus lunch, this experience takes you on a discovery tour of Australia's favourite islands. Two Whitsunday Islands, nine hours and the horizon - this is one magnificent day trip! Venture beyond normal tracks and visit Long and Daydream Islands in one fantastic day - lunch included. This fully-guided experience gives you the opportunity to enjoy the resorts, walk the tracks and see it all! Two Whitsunday Islands, nine hours and the horizon - this is one magnificent day trip! Venture beyond normal tracks and visit Long and Daydream Islands in one fantastic day - lunch included. This fully-guided experience gives you the opportunity to enjoy the resorts and take in the surrounds. It's a Whitsunday must-do: a day trip to Knuckle Reef for a fun day off an amazing pontoon! Cruise out to the reef and visit our wonderfully deluxe complex, all afloat on the gorgeous coral reef. This experience includes a buffet lunch and all snacks, so you can relax and enjoy a beautiful day out. This Whitsunday Day Trip to Knuckle Reef has so much, but most importantly, there's a GIANT WATERSLIDE! You will cruise far off the Australian coast to swim with marine life, from sea anemone to giant fish! Travel out to the cool pontoon and relax on the beautiful coral reef! Whitsunday Island holiday package including coach and vessel transfers, backpacker accommodation at both Airlie Beach and Long Island and two of the best day trips in the Whitsundays - The Great Barrier Reef Adventure and Camira Sailing Adventure. It's the ultimate Whitsunday Family Day Trip - out to Knuckle Reef! 55 nautical miles off the coast of Australia, you'll enjoy a marine wonderland! The pontoon has a giant slide, air-conditioned areas, patrolled swimming and snorkelling, plus optional extras like scuba diving and snorkel safaris. Cruise the comfortable waters of the Whitsunday Islands on 'Voyager', a comfortable, 23 metre, high speed catamaran. Visiting Hook Island, Whitehaven Beach and Daydream Island you will experience a variety of Whitsunday Islands scenery. Cruising Whitsundays is already a sublime experience - now you can relax, it's all planned for you! This full-day experience includes lunch, refreshments and snorkelling around the Whitsunday Islands on a modern catamaran. Crystal clear water and a sun-soaked deck make this a heavenly day out! Now you're cruising the Whitsundays in style! This family experience includes lunch, snacks and a beautiful day sailing on a top-of-the-line catamaran. This vessel is top-notch, so jump on to swim, snorkel and sail the gorgeous marine park all day. Even the kids will feel the serenity! Go cruising the Whitsunday Islands in style! This comfortable catamaran can reach speeds of up to 30 knots. With crystal clear water all around you, you'll be able to swim, snorkel, see heaps of sights and wonderous marine life - it's the Whitsundays' best day out!